Installing an application is not enough: to maintain site stability, and security, it's important to keep your web applications updated. 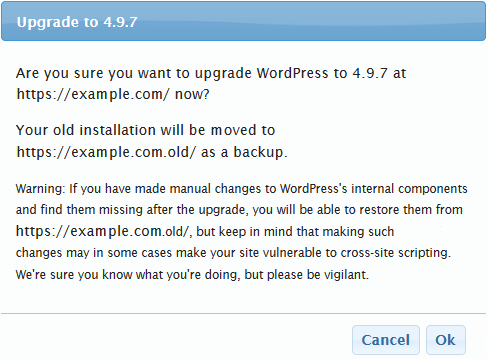 This article details how to update web apps installed via the One-Click Installer in your panel. Some One-Click Installs in the panel are not as current as the version on the developers website. 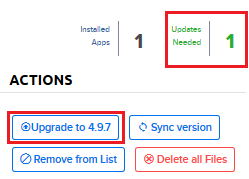 In these cases, the only option to upgrade would be to visit the developers website and follow their instructions on how to manually upgrade. By default, One-Click installations are set to upgrade automatically with each major update. You receive an email notification once an upgrade has completed. Go to One-Click Installs in the panel. The One-Click Installs page opens. Click the Manage Installed Applications button to view your One-Click applications. A page appears that lists your domains with installed applications. 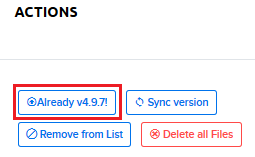 Beneath the Upgrade Action column, click on the edit link. No action: No One-Click upgrades are performed by DreamHost for this domain. Notify me: Only alerts you via email once a major revision update is available. No update is performed. Upgrade automatically: Upgrades the site and emails you automatically. Upgrade without notification: Upgrades the site but doesn’t email you. Click the Manage Installed Applications button. To the right of your domain, check if you see a "1" next to 'Updates Needed'. 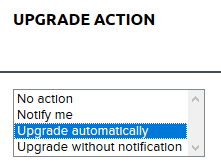 Below the Actions column, you can click on the Upgrade to X.X action to upgrade your site. 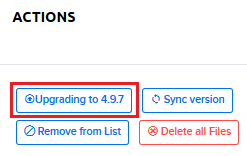 In this example, the upgrade action says Upgrade to 4.9.7. A confirmation box appears. Click the Ok button to continue. A Success! box opens confirming the upgrade is in process. What if I moved the directory my One-Click was installed under? If you have moved the directory location of your One-Click install, the panel will not update this automatically, you must contact support. Inform support of the One-Click Install and the directory you moved it to. Support can then adjust the panel path for you.